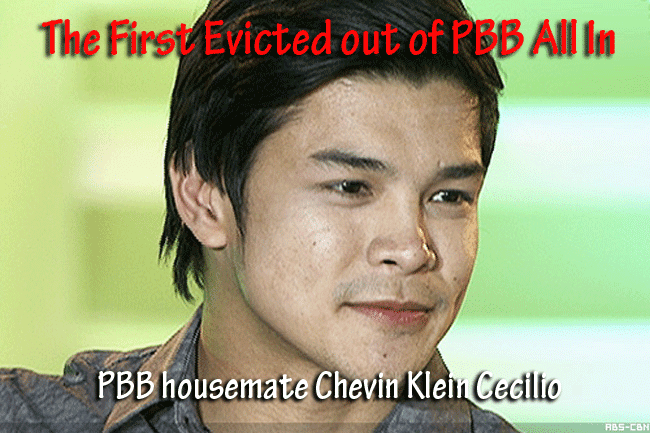 Manila, Philippines - PBB housemate Chevin Klein Cecilio is the first to be Evicted out in PBB ALL IN Edition. He is dubbed as the "Simpatikong Salesman ng CamSur" and he will be the first one to be evicted from the Pinoy Big Brother (PBB) house on night of Saturday May 17, 2014. Chevin Cecilio, as included on the first nominated housemates, he was the first housemate to be evicted through the quality pick of receiving the most points from his fellow housemates, garnered all-time low share of votes from home viewers with 30.24 percent, throughout PBB ALL IN 1st eviction night. In last week's Saturday episode, the opposite contestants of the fact TV show expressed their dismay over Cecilio's perspective towards the daily tasks and chores. "Pag may task, parang magagalitin po siya," explained Joshua Garcia, a fellow housemate, of his call to allot his 2 points to Cecilio. Before going the house, Chevin thanked and hugged his fellow housemates. When he was asked regarding who he will miss the foremost within the PBB house, Chevin mentioned Alex Gonzaga. "Lahat po ng problems and mga nararamdaman ko sinasabi ko sa kanya," he said. The two other nominated housemates were Loisa Andalio and Maris Racal with garnered 39.37 percent and 30.38 percent respectively, they are now safe.